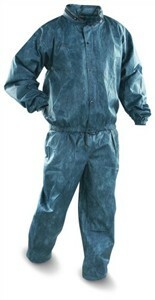 I really like this Frogg Toggs Pro Action Rain Suit. This is the tried and true original that outdoorsman have been wearing for years. You golfers are going to love it because it's very light and compact and will fit in your golf bag very easily. In a good rain suit, I look for two main things: Of course I want it to keep me dry, but I also want it to breathe. It doesn't do me much good if the outside moisture stays out but I drown to death in my own sweat -- gross. This suit fits the bill as it is very breathable and comfortable. In addition, the suit is not only waterproof, but it's windproof with a retractable hood. I also really like the pass-through pants pockets so I can still get to my green tool and ball marker. One word to the wise: order one size up, thus you'll have enough room to put it on over your clothes.